Amongst all other Sovereigns, George V Gold coins are special for their history and numismatic value. What really sets these beautiful coins apart is that they were actually coins in circulation in Great Britain when WWI broke out in 1914. Printed by the Royal Mint and six branches all across the Empire, which was at its peak at the time, George V Gold Sovereigns mystifyingly commemorate the glorious days of Great Britain under the reign of one of its most popular monarchs. Why Buy George V Gold Sovereign coins? Charged with history and emotion, George V Gold Sovereigns are a top priority choice for investors and coin collectors alike. And even though they are 100 years old and of great numismatic and commemorative value, they sell at a small premium, as millions were minted and hundreds of thousands were kept in vaults, especially during and immediately after the Great War, and are in mint condition. Apart for exceptional value for money, a George V Sovereign would certainly be the humble pride of your collection. George V Sovereigns are made of 91⅔% fine gold and weigh 7.98g; they are 22.05 mm in diameter and 1.52 mm thick. The original design of the coin changed to a smaller version in 1929, incorporating an inner circle and double beading around the coin's edge in an attempt to improve the level of detail of designs both in the obverse and the reverse sides. The reverse side features the traditional, all-time classic design of St George slaying the Dragon accordingly modified for the two types of coins. The year of issue and mintmark (if any),for quality control and identification purposes, are displayed at the bottom. 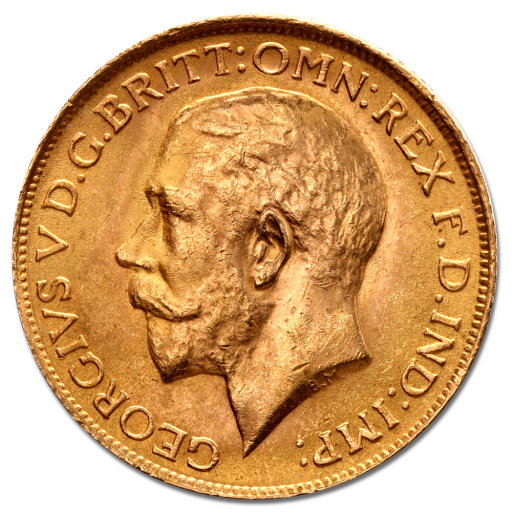 George V Sovereigns, also referred to as WWI Gold Sovereign coins, were the last British gold coins in circulation until 1932 when Britain left the gold standard. They are the only coins to have been manufactured at all six branches of the Royal Mint. However, owing to dramatic changes in the world during this time, these would ultimately be the last to carry mintmarks. It is indeed amazing that today, senior British citizens actually remember using these coins as pocket or purse money! 1914-1918 coins were minted in London (until 1917),Australia (Sydney, Melbourne and Perth),Ottawa, Canada and Bombay, India, while the last George V Sovereign was minted in 1932 in Pretoria, South Africa. As a result of the First World War (1914–18),most other European empires fell while the British Empire expanded to its greatest effective extent. In 1917, King George V became the first monarch of the House of Windsor which he renamed from the House of Saxe-Coburg and Gotha. George's reign saw the rise of socialism, communism, fascism, and the Indian independence movement, all of which radically changed the political landscape, resulting in a redesign of the monarchy's social role to be more inclusive of the working class and its representatives. George adopted a more democratic stance that crossed class lines and brought the monarchy closer to the public. King George V was plagued by illness throughout much of his reign and at his death was succeeded by his eldest son, Edward VIII. Since the time of Queen Victoria, the forgery "trade" had taken such large proportions that Sovereigns were recycled every 15 years, so that the coins could be checked and repaired. With time, people became more cautious, and the Royal Mint took counterfeiting and fraud extremely seriously. Nothing has changed other than advanced minting measures to increased security, and all George V Sovereign coins were minted to precise specifications concerning the design, dimensions and weight, as defined by legislation. They look nothing like a crude copy of the time, made of very little gold, thus being either underweight or too large. Poor quality counterfeit Sovereigns of this period can easily be detected by experienced dealers at first glimpse. If you have George V Gold Full Sovereigns for sale, do come in contact with a friendly member of our staff who will be happy to arrange a gold price for you and prepare a fixed, limited time fee offer; we will promptly send you a confirmation of the offer by email. As leading distributors of gold bullion coins, CoinInvest GmbH offer highly competitive prices on George V Gold Full Sovereigns, and with limited resources available on mint condition coins, we strongly suggest you place an order at the earliest convenience to avoid disappointment. To purchase your George V Sovereigns, simply sign into your CoinInvest account, and add the number of coins you desire to your basket by clicking on the orange strip in the volume pricing section. If we have the coin in stock, we will process your order immediately, but you should allow at least 10 working days for delivery, as some bank transfers do not reach us for up to 7 days depending on your bank and country of residence. I had to do a history project on this coin it it saved my life as this site has the only information online about this coin.